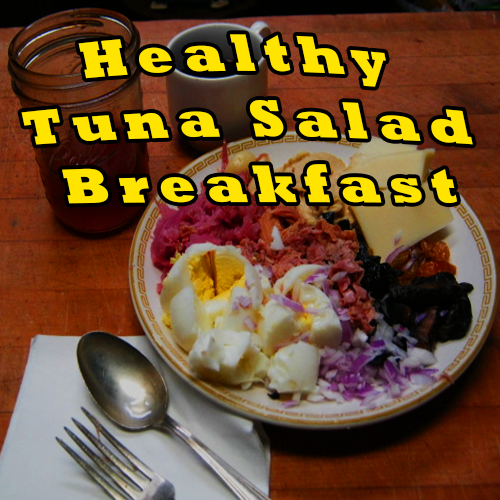 A Healthy Tuna Salad Breakfast will give you a good protein boost to start your day. 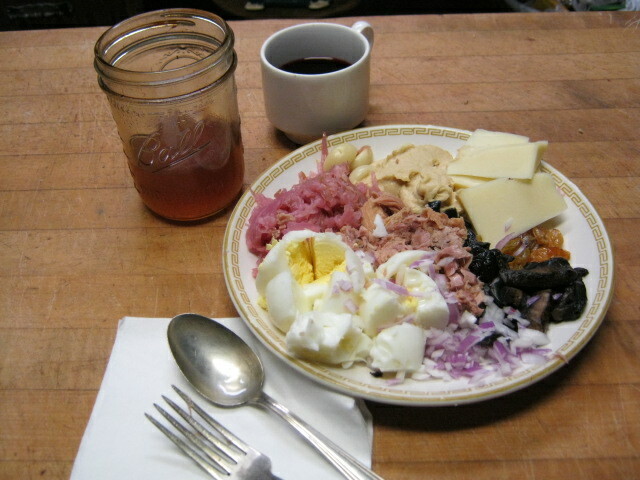 This breakfast offers a mental and energetic resource to keep you moving. This breakfast provides a host of nutrients for a hungry brain and body. The black olives, hard cheese, fermented garlic, raw red onions, gin-soaked raisins, hummus, sautéed portabella mushrooms, and free-range eggs contain trace elements that the body craves. These foods are all compatible and will digest well. Some Limburger Cheese would help too, but I left it out because this salad already contains about 5,000 calories. Raw sauerkraut rules the meal, with over 400 types of probiotics and lots of fiber, you will be happy and healthy (live yogurt contains 2 or 3 types of probiotics.) Extra virgin olive oil will provide lots of Omega-3 oil for a healthy body and brain. The tuna fish is also loaded with omega-3 oils that are important for health–especially brain health. Pomegranate Juice is a powerful drink that provides many health benefits. A few ounces of Pomegranate juice and a spoonful of Jo’s Fire Cider will make your days’ journey more fun.